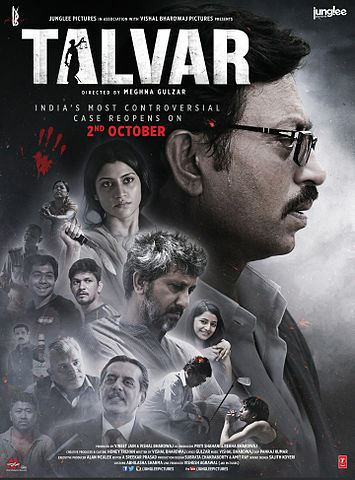 The movie Talvar is based on true story of the controversial double murder case of a 14 year old girl and a house help in Noida, the case was filed in 2008. As part of the special preview screening for bloggers organized by blogmint i got a chance to view the movie first hand. Thou many of us would have read the newspapers and watched the special coverage report by News channel about the case, there is much more to the case then what we think we know , the movie Talvar has showcase that details and minutes in a very undramatic way, considering the seriousness of the case.I feel the movie has its stand very clear in the case and wants to show a wide perspective of the complete investigation, a perspective in which it is for us to decide what is right. 1) Screenplay : The adaptation of the case elements are very well portrayed. 2) Perspective: The different angles and viewpoints of the people related to the case is well shown. 3) Cast: All the actors specially Irrfan, and Konkana Sen made the scenes come alive with the method acting skills, truly vivid contrast to what they have acted before. 4) Plot: There were no dramatic elements added in this movie Talvar, considering the seriousness, it covered all the view points and elements in details of case, which really turned out very well in trying to showcase as in what really happened! 5) Detailing overall scenes: Nothing is left half read or half told, the detailing of each testimony ,key frames and curiosity is maintained till the very end. Thou I am not a big fan of documentary/ dark titled movies, but full credit goes to the writer of the movie Talvar Mr. Vishal Bhardwaj for scripting the emotions and soul of the characters in such a presentable way, even the direction headed by Meghna Gulzar of the movie Talvar is to be given credit for taking a bold step and moving ahead with the movie. Overall, i feel its a movie you should not miss, thou many of us might be well verse with the case however the way the case has been opened up from all perspective is something to watch out for in the movie and finally is the justice served is something that we ultimately have to decide, if for nothing else.